Novitiate Notes: The General at prayer. As I noted in this November post, Jesuit superior general Father Peter-Hans Kolvenbach is a priest of the Armenian Catholic Church, one of the Eastern Christian churches in communion with the See of Rome. 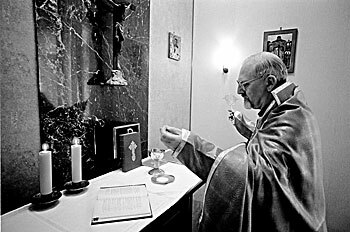 For your edification, here's a photo of Father General celebrating the Armenian Divine Liturgy in a chapel at the Jesuit Curia in Rome. This picture is part of a 1988 photo essay by Father Don Doll, a Jesuit photographer based at Creighton University. Father Doll's photos of the General offer a rare inside glimpse of life at the Society's Roman headquarters, and I'm happy to commend them to your attention. AMDG. Whoa, I had no idea! I lived with an Armenian family when I studied in Russia, and I suspect my faith would still be anemic (or I would no longer be Christian) if it hadn't been for living with them. They were part of the Armenian Apostolic Church, which is Orthodox, but I am constantly impressed with the spirituality of the Armenian churches. Thanks for the link to the photo essay! This is great! Thanks Joe! I have been to Armenian mass, for Talanian's mother. It has to be one of the most elaborate and beautiful ceremonies and rituals I have ever been too. The dedication they exhibit to their faith is very impressive. Yes, I remember when you went to the Talanian funeral - sounds like quite the experience.